I am a descendant of traditional Czech traveling Romani people, and I was born after the end of the Second World War in the year 1946. Both my parents were imprisoned in Nazi concentration camps for four years. My parents met each other after the war ended, and I was born in 1946. Both of them, along with the families they had at the time – Czech indigenous travelling Romani people – were imprisoned for four years in Nazi concentration camps where almost all of their family members perished. From infancy I grew up in an environment where there was discussion of my parents’ suffering and that of other Romani families during the Nazi era, and I subconsciously developed a sensitivity to totalitarian regimes in any form. Until the age of approximately eight I would go to primary school from our caravan. In those days my parents lived the traveling way of life. However, my parents decided that being educated in this itinerant way was not appropriate for me – they wanted me, after completing primary school, to educate myself further, and therefore for some time I lived in the family of my father’s brother, who was settled in Liberec. I attended primary school there until 1958, when the law banning “migration” began to take effect and made it impossible for my parents to live in the traveling way anymore. Since then my family and the families of my three siblings have lived in the town of Hořice in the Podkrkonoší area. I completed my primary education there and then apprenticed in stonemasonry in Lipnice nad Sázavou. From 1965 until 1967 I did my basic military service. The craft of stonemasonry amused me and I performed it until 1990, when I began to have health problems. I began to make a living for my family through trade - I am the father of four children. In 1991 my father learned that the surviving prisoners of Nazi concentration camps were able to apply to the Czech Defense Ministry and be awarded the status of political prisoners, which guaranteed them certain social advantages ameliorating their suffering and facilitating improvements for the rest of their lives. Neither my father nor my mother could either read or write, just like the rest of the survivors, so I took up the task of handling their claims. It was logical and felt it was my obligation to negotiate redress in these matters, and therefore I aided almost all of the Czech traditional Romani and Sinti people who had survived Nazism, and I still aid them with acquiring the compensation to which they are justifiably entitled. Over time I began to perceive providing this assistance as my calling. I am now retired and basically I have more time for these activities than if I were working. In 1997 I was entrusted by the Czech Traditional Roma and Sinti Council of Elders (Rada starších z řad tradičních českých Romů a Sintů) with advocating for the justified claims of the former Romani prisoners of concentration camps and the surviving relatives of the victims. We established a civic association, the Committee for the Redress of the Roma Holocaust in the Czech Republic (Výbor pro odškodnění romského holocaustu v ČR - VPORH), of which I am still the head to this day. We bring together former concentration camp prisoners and the surviving relatives of the victims and continue, in an organized fashion, my previous activities, such as initiating conferences and seminars, organizing information campaigns, and settling the property claims of the Roma and Sinti and the undignified state of the site of the former concentration camp at Lety u Písku and its burial sites. One of the important aims of our association is to inform the public, including Romani people themselves, about the suffering of Roma and Sinti during the Nazi era and to point out what kinds of behavior are acceptable in the socially excluded localities. The aim of our work is to contribute toward settling the relations between non-Roma and Roma so that they become acceptable to all. Since 1994, I have organized aid to the Romani victims of Nazism when defending their justiifed claims for compensation. VPORH was established in 1998 and remains the contact office for Romani and Sinti victims of Nazism and the surviving relatives of the victims in the area of compensation. 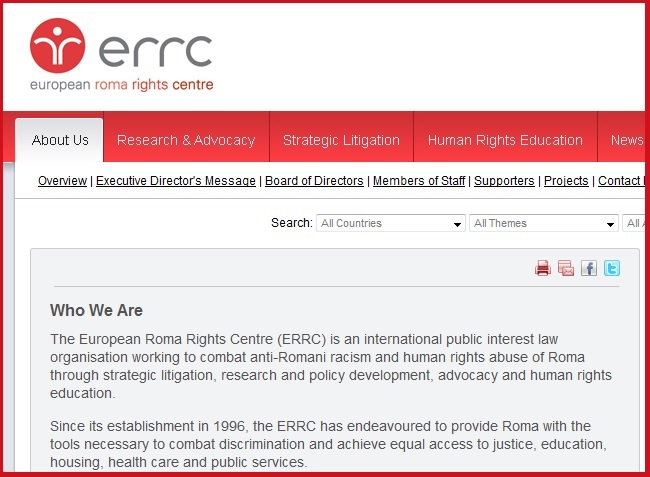 From 1998 until 2002 I also worked as an external advisor to the European Roma Rights Centre (ERRC), on organizing, among other matters, a project mapping Romani children enrolled in the so-called “special schools”. In 1999 I organized a conference in the Chamber of Deputies of the Parliament of the Czech Republic focusing on the Romani Holocaust and on the situation of the memorial at Lety u Písku. It was atended by 400 people – legislators across the political spectrum, some ministers, cultural figures, representatives of churches and other organizations, historians, former prisoners of the Nazi concentration camps, and the surviving relatives of the victims. In 1998 we began our activity with support from the Government of the Czech Republic and the Good Will Committee of Olga Havlová by looking for the surviving Romani prisoners of the Nazi concentration camps and organizing a Meeting of the Children of Lety. (We have been creating a list of the prisoners from that concentration camp who are still alive today). In 1998 our association led communications with representiatves of banks in Switzerland and organized the delivery of humanitarian aid from those banks to the needy Romani victims of Nazism. In collaboration with the European Union, the Foreign Ministry of the Federal Republic of Germany, the Government of the Czech Republic, and other organizations, we have successfully implemented several projects in recent years. These have primarily been educational projects supporting the preservation of the historical memory of Romani and Sinti people living in the Czech Republic. Beginning in 1999 we co-organized and initiated in the Chamber of Deputies a public hearing about the past and present of the sites of the former camps at Hodonín u Kunštátu and Lety u Písku. The hearing was attended by more than 400 persons (MPs and Senators, cultural figures, Romani figures, former prisoners and the surviving relatives of the victims). In that same year the representatives of our Committee became members of the mixed historical and societal commission at the Office of the Government of the Czech Republic. That commission prepared the material that became the starting point for the Government’s decisions on how to proceed in the matter of the desecration of the sites of these former concentration camps. In 2001, with the financial support of the Government of the Czech Republic, we implemented a project to artistically design memorial plaques with the names of the 180 victims who died of racial violence at the Lety concentration camp. They are buried along the cemetery walls in Mirovice u Písku, where some of the victims of the camp are laid to rest. In 2002, based on the ideas of the Romani victims of Nazism and their surviving relatives, we created, with the financial support of the German Foreign Ministry, another memorial. The sculptures of three larger-than-life female figures at the cemetery augment the memorial plaques with the names primarily of the children who are buried there. In the year 2005 we created and presented at the European Parliament in Brussels an exhibition entitled “Lety: Story of a Silenced Genocide”. The presentation of the exhibition there was co-organized by MEP Milan Horáček. 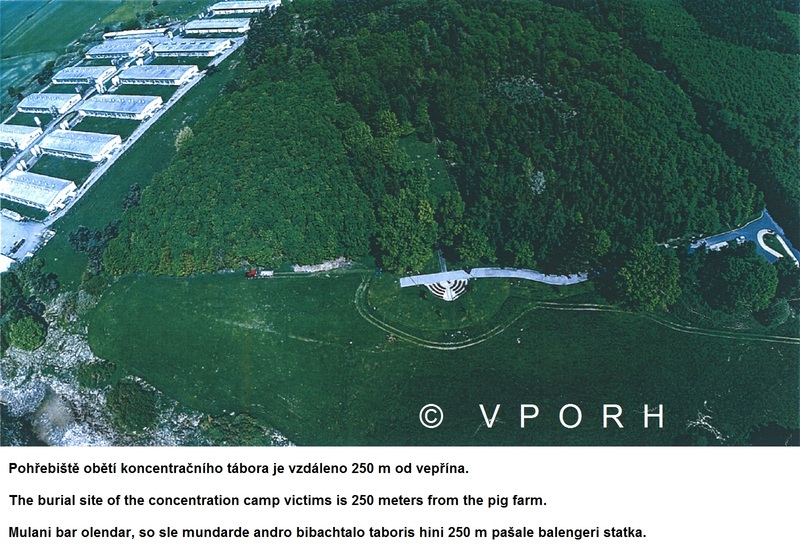 Thanks to a call by Members of the European Parliament on 28 April 2005 to close the operations of the pig farm on the site of the former concentration camp and to establish an appropriate memorial there, there was an extensive discussion of the issue in the Czech media and the broader public could become more informed about what happened in the camp. In June 2005, under the auspices of the chair of the Chamber of Deputies, Czech MP Lubomír Zaorálek, we presented that same exhibition at the Chamber of Deputies of the Parliament of the Czech Republic. Czech Prime Minister Jiří Paroubek spoke at the opening. Among the approximately 200 guests was former Czech President Václav Havel, as well as other politicians, several representatives of the diplomatic corps in Prague, the Romani concentration camp prisoners and the victims’ surviving relatives. After that we also presented the exhibition in the Czech Senate, where it was opened by the vice-chair of the Senate, Petr Pithart, and attended by 80 people. 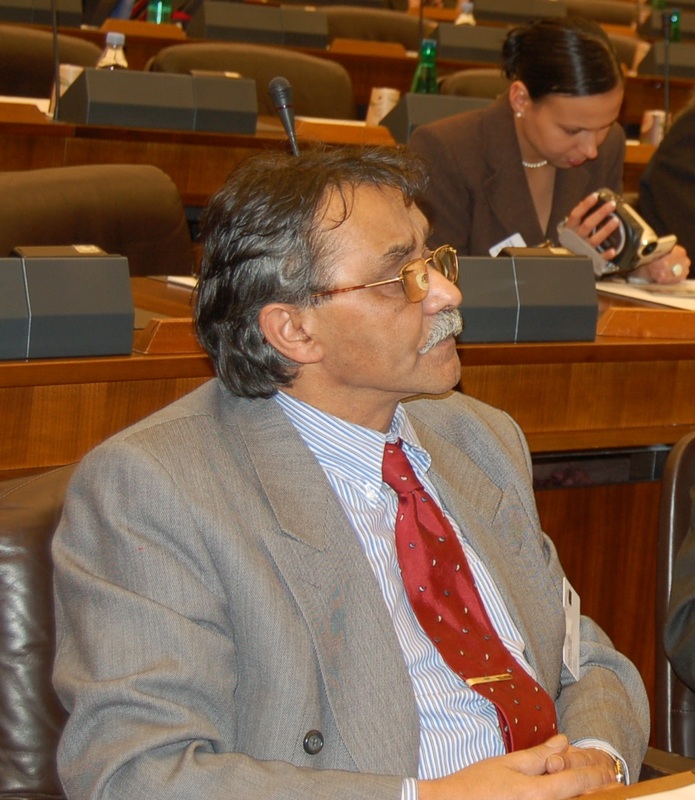 In 2006 I co-organized and initiated a public hearing in the Senate of the Parliament of the Czech Republic that was thematically focused on the issue of the education of Romani children. The matters of redressing these wrongs against the victims of Nazism have, of course, an international character. 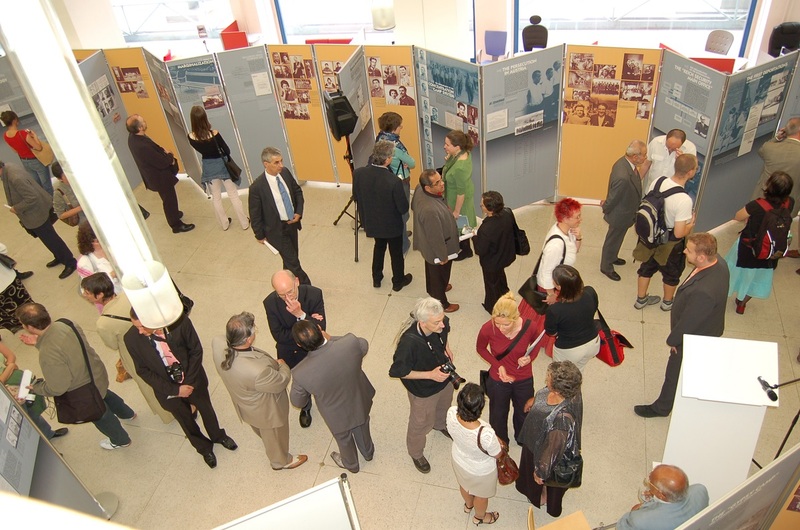 In 2006, with the support of the City of Prague, the Czech Culture Ministry, the Czech-German Fund for the Future and other institutions, we presented an extensive travelling exhibition entited “The Romani Holocaust – Genocide of the Sinti and Roma and Racism in Europe Today”. The exhibition was created by the Documentation Centre of the German Sinti and Roma, headquartered in Heidelberg, Germany (the director of which is Romani Rose, a Sinto). The Committee contributed unique vintage photographs from the private archives of the Czech Roma and Sinti to create the exhibition. In 2007, in collaboration with the surviving relatives of the victims, we created a traveling exhibition entitled “A Vanished World”. The exhibition became the historically first attempt to present the public with the actual lives of the indigenous Czech Roma and Sinti and their imprisonment in the Nazi concentration camps. The first presentation of the exhibition was launched on 5 September at the National Gallery in Prague (Veletržní palác) by Czech President Václav Klaus. The opening was attended by up to 300 guests. Because of the surprisingly big interest in the exhibition, we reprised it in Prague at the Portheimka Gallery. After that it was presented to the public over the next two years in the cities of Brno, Chomutov, Karlovy Vary, Mladá Boleslav, Opava, Ostrava, Plzeň and Ústí nad Labem. The exhibition serves to provide information about what happened to Romani people during Nazism. 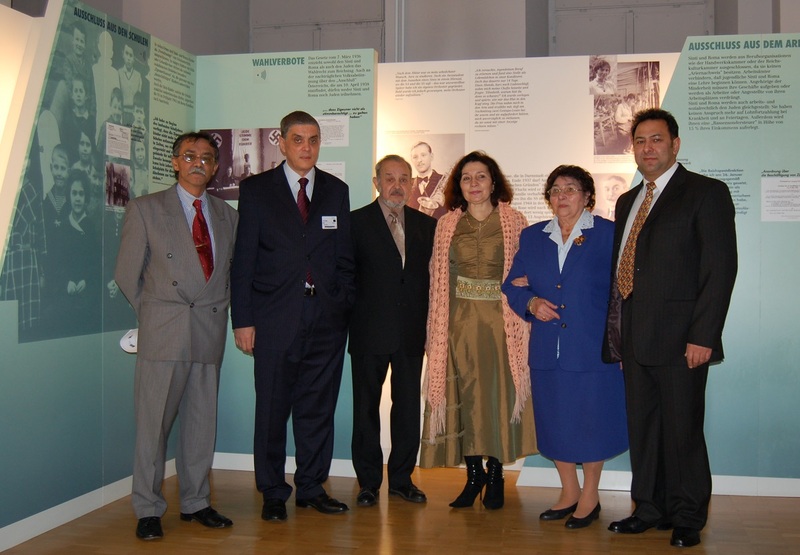 In 2007 the Documentation Centre of the German Sinti and Roma, along with our organization and other Romani organizations abroad representing the victims of Nazism accompanied the extensive travelling exhibition entited “The Romani Holocaust – Genocide of the Sinti and Roma and Racism in Europe Today” when it was exhibited at the headquarters of the United Nations in New York. After that our organization convened discussions with non-Romani and Romani citizens in the towns of České Budějovice, Hořice, Jičín, Mimoň, Rotava and Sokolov that were thematically focused on the broken relations between the majority society and Romani people and possible ways to address them. These talks were attended by approximately 300 people. 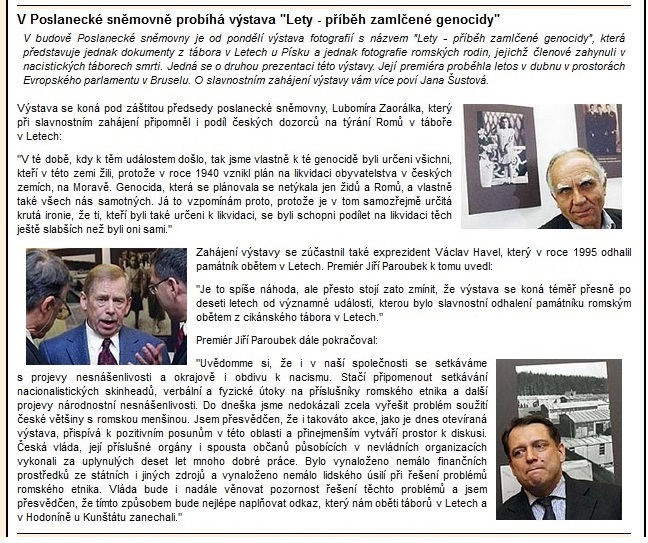 In June 2012, Czech Prime Minister Petr Nečas visited the remembrance site at Lety and public summarized the consequences of the order issued by the General Command of the Protectorate Police about Romani people, emphasizing that: “That date can be considered the beginning of the genocide against Roma and Sinti, which led as a consequence to the liquidation, in practice, of this minority on the territory of the Protectorate. Romani people, therefore, in terms of the percentage of their population affected, bore the greatest sacrifice on our territory during the Second World War, and therefore their fates are inextricably part of the tragic history of our country.” He then reminded the public that the Czech authorities had been involved with the Romani genocide. In 2014 I became a member of the Czech Government Council for Romani Minority Affairs, a member of its Committee on Local Administrations, and chair of its Working Group for Romani Compensation. Addressing the matters of the Holocaust of Roma and Sinti has become one of the important aims of the concept for Romani integration approved by the Czech Government as a policy until 2020. In 2015 I began to collaborate with the Terezín Institute as part of a project training teachers about the culture and history of Roma and Sinti in the Czech lands. After these lectures the teachers expressed their enthusiasm and asked for more lectures in different parts of the country. I have been unable to keep up with the demand as my schedule is fully booked. Also in 2015 our organization, in collaboration with Slovo 21 as part of the international KHAMORO festival presented the exhibition “A Vanished World at the Czech Centre in Prague. Within the framework I gave nine lectures at the Czech Center to students from schools in Prague, familiarizing them with the culture and history of the Czech and Moravian Roma and Sinti. The students and teachers left those lectures excited by what they had learned and full of positive impressions. Source: website of National gallery in Prague. Source: website of European Roma Rights Centre. 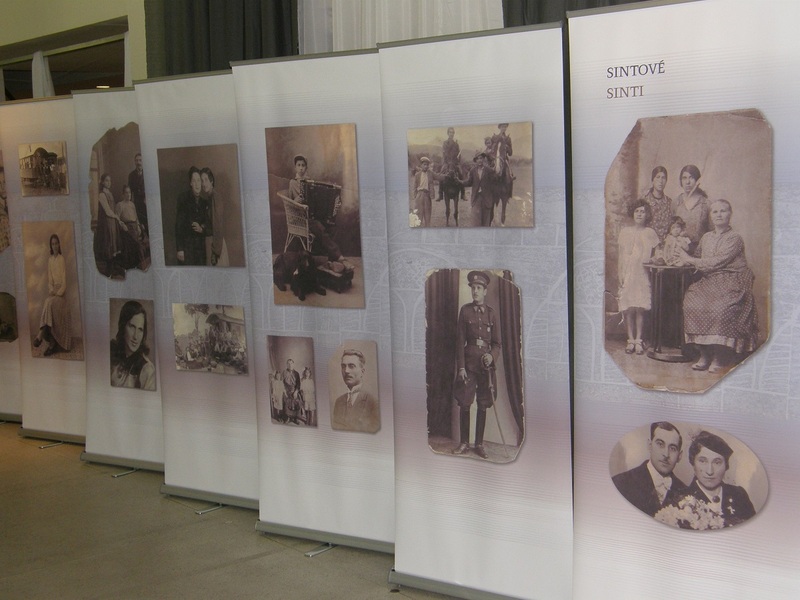 The exhibition "Roma Holocaust - the genocide of Sinti and Roma and racism in present Europe". Source: website of Czech Senate. Source: website of Czech Radio.